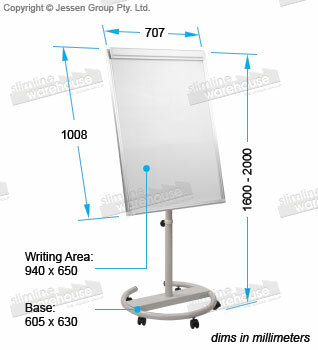 The magnetic white board, portable whiteboard easel is a versatile display that has many uses. 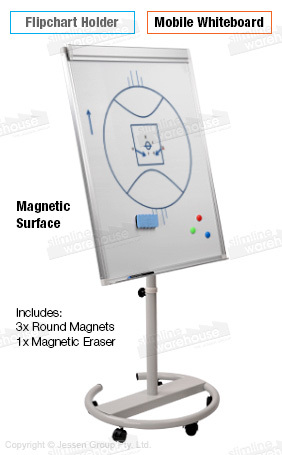 The dry erase board itself is also magnetic to hold up posters using the (3) included magnets, with an eraser also included for easy clean-up. The top of the board has a snap flip chart holder for paper up to 668mm wide. Hooks beneath the holder can hold a ream of paper as well. The total writing area is 940 x 650mm to provide heaps of space. This height adjustable white board lets any person but the display at a comfortable height for use. A knob at the back of the display holds the pole firmly in position, with an available height range between 1.6 & 2m. Markers are kept close at hand in the pen tray at the base of the board. This display ships same day from our warehouse to anywhere in Australia when purchased by 2pm EST, order online today! Pen tray at base of board holds markers or included magnetic eraser!